What is a Minnesota Month to Month Lease Agreement? 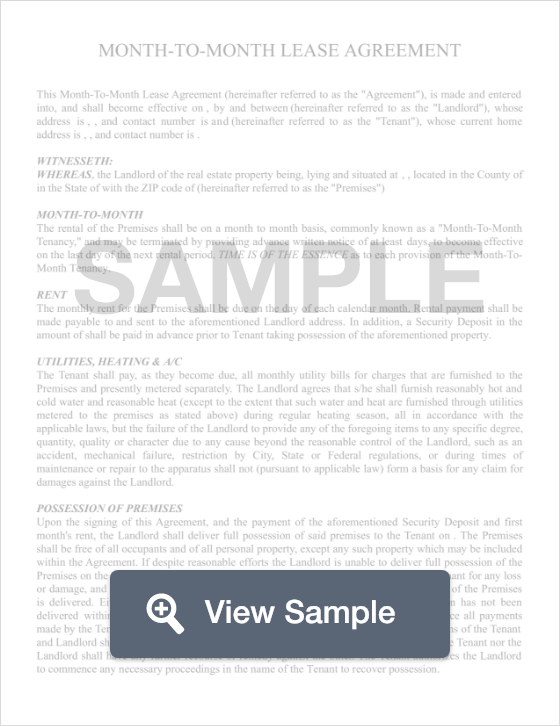 Minnesota Month to Month Lease Agreement: What Is It? In Minnesota, a month to month lease agreement is a legal document that landlords use to establish a short term agreement with a tenant. In these agreements, a landlord and tenant come into an agreement that there will be a tenancy for the period of one (1) month. Although these agreements are only valid for a month, they renew at the beginning of each month, making them essentially open-ended and indefinite until either the tenant or the landlord decides to terminate the lease. This type of agreement is beneficial for both landlords and tenants in the sense that it offers great flexibility without a long term commitment and can range from only one month to as long as the apartment is needed. In Minnesota, a tenant or landlord must provide, in writing, a notice that states that the lease will soon come to an end. This notice is to be presented to the other party at least one internal that the rent is due, or three months (whichever is less). For example, if a tenant wishes to terminate a lease and he or she normally pays rent at the beginning of every month, then a termination letter must be sent one (1) month before the termination will take effect. Furthermore, if a tenant neglects to pay rent, the landlord may send the tenant a 14-day termination letter.